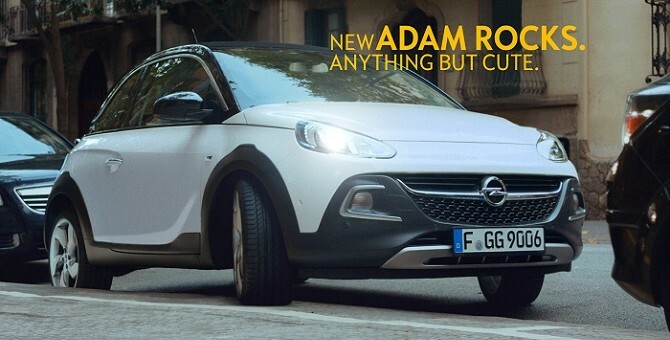 Opel recently launched a new TV ad campaign for its rugged Adam Rocks city car based around the tagline “anything but cute.” The automaker said the ads would be “fresh, cheeky and above all humorous,” and we’d have to agree after seeing this short 20-second spot from the series. The Adam Rocks offers customers a more rugged, go-anywhere version of the standard Adam. The most prominent changes to the car include plastic body cladding, 15 millimeters of additional ground clearance and a retractable soft-top roof. It will also be offered with Opel’s new 1.0-liter three-cylinder turbocharged engine. This German-language ad appears to want to draw the viewer’s focus towards the unique open-roof design. In it, the driver of the Adam Rocks’ dog spots two girls playing Frisbee in park as they drive by. When their Frisbee flies towards the car, the dog jumps out through the roof to grab it and piles it with the rest of the Frisbees he’s stolen in the same fashion. Just like Opel said, fresh, cheeky and humorous. Check out the ad just below and let us know what you think in the comments. Opel didn’t provide captions for the video either, so if you’re like us and aren’t fluent in German, you’ll have to make do with just the visuals. Hi, please tell me the name of the male model/actor in the Adam Rocks commercial.